As part of getting trained in science communications via the Science Impact Project, I had to prepare and deliver a "TED-style" talk. It was terrifying and hard work, especially to slow down and take a more personal storytelling approach to my work (talking about my family's farm), but I'm pretty happy with the end result. and a pic of (from right to left) my great-grandfather Robert and great-grandmother Marjorie (the original farmers), my grandfather Hickman and grandmother Jurie, and two people I'm not sure about! 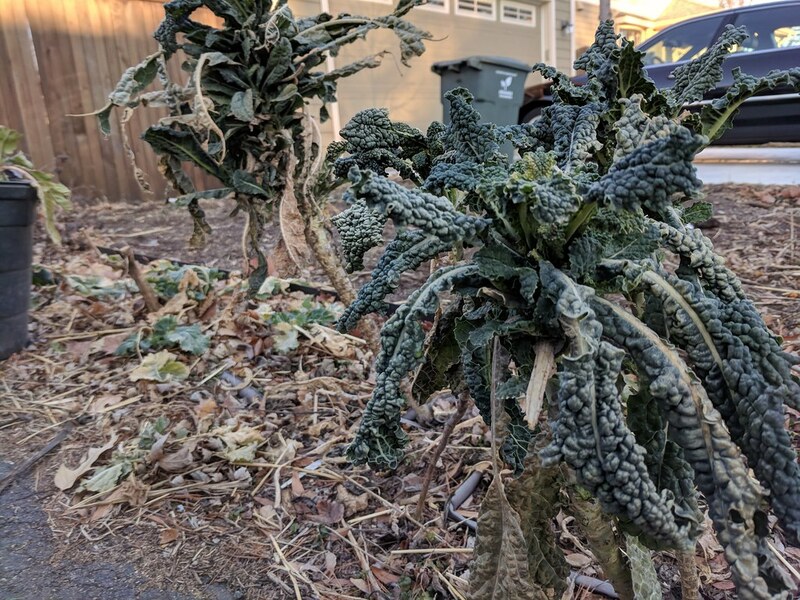 The struggle to find good produce in the depth of winter (see my sad kale above) has me thinking about nutrients, so this month I've focused on papers about nutrients in the sense of fertilizer on croplands (focused on N & P, plus one about crop nutrition). Finally: unrelated to science, I was impressed how much the Engaging Across Differences has jump-started the way I think about and engage around diversity. They're looking for people to sign up for the next workshops, and I'd encourage all TNC staff to give it serious thought. Let me know if you'd like to discuss further; it's led me to co-host an ongoing workshop at our headquarters about how we can all step up and be better allies to each other. AGRICULTURE (NITROGEN): The first three papers all come from Xin Zhang at China Agricultural University in Beijing. Zhang et al 2015 (in Nature) looks at global historic patterns of nitrogen fertilizer use and efficiency, identifying opportunities for improvement. Optimizing nitrogen use efficiency (NUE) means avoiding N loss to the air and water, but also ensuring crops have enough N. Start with Table 1 - which highlights the severe (and worsening) excess in India and China, driven partly by low subsidized fertilizer prices. Fig 4 is also really interesting - it compares efficency in the US and China, partly due to efficiency, and partly due to what we grow (e.g. in the US we grow a lot of soy that doesn't need N). The other Zhang et al 2015 article (in JEQ) looks at how the economics of promoting technology and best management practices to improve nitrogen use efficiency (NUE) on farms. They model different kinds of improvements, whether they maintain yields at a lower input rate, improve yields at a similar input rate, or improve yields but require more fertilizer as well (e.g. by improving crop genetics). It's a cool (albeit wonky) paper, and Figures 4-7 explore the conditions under which implementing these practices can boost both profit and environmental outcomes. Table 4 shows that for Midwestern corn, at relatively high fertilizer prices improved genetics can be the best strategy, while at lower prices other approaches perform better (with changing the crop running the risk of environmental harm from excess nitrogen). They conclude with policy recommendations around how shifting from subsidies for fertilizer to subsidies for improved practices can help improve NUE. Table 6 has guidelines on how to find the optimal price ranges for both fertilizer and BMPs. A final twist: practices that don't boost yield are less likely to be adopted (even if they save cost), while yield-boosting practices are more appealing but also run more risk of excess N being lost. Zhang et al. 2017 has some good news in the form of a case study in Huantai county in northern China. While China's overall NUE has gotten worse over the past several decades, it has improved in Huantai. Primary drivers appear to be incorporation of crop straw into soil, and subsidized mechanization of farmland in the area. Overuse of groundwater for irrigation, however, remains a major challenge. Nonetheless, this provides a road map for how the rest of China may be able to follow suit. Wagner-Riddle et al. 2017 looks specifically at the importance of soil freezing and thawing in correctly estimating N2O emissions. Essentially, when frozen soil thaws, it emits a lot more N2o (a potent greenhouse gas). They estimate that global N2O emissions from cropland may be 17-28% too low due to neglecting to account for soil freezing and thawing. Sweeney 2017 is another paper finding that long term no-till redistributes soil carbon to the surface but doesn't boost total soil carbon (this case was a claypan soil). More oddly, they found tillage and N fertilization didn't impact soil bulk density or resistance. Christianson et al. 2016 is a review of phosphorous being lost via farm drainage, both subsurface (tile) drains and surface drains like ditches. There is a lot of interesting data packed in here, but three things jumped out at me. First is that overall P loads were higher in surface drainage than subsurface drainage (Fig 2). The other was that no-till fields lost about triple the P compared to conventional or even conservation tillage. So no-till may reduce sediment losses but increase P losses, presenting an interesting trade-off. Third is that P losses tend to be relatively small (<5% applied) compared to N losses (~15-20%), which reduces the economic incentive for farmers to address P loss. Jarvie et al. 2017 looked at soluble reactive phosphorous (SRP) in the Western Lake Erie Basin, and looked for correlations with changing agricultural practices. They had data for changes in tillage, and used changing "flashiness" of river flow as a proxy for increased drainage. They note that many factors could have caused the increasing river SRP loads, but attribute 1/3 to increased drainage water flow and 2/3 to an increase in SRP delivery. They concluded that no-till and drainage were both likely responsible for the increasing SRP delivery, but I'm not convinced. Figure 3 and Table 4 show that across the three studied rivers there was not a clear relationship between tillage and drainage and SRP.